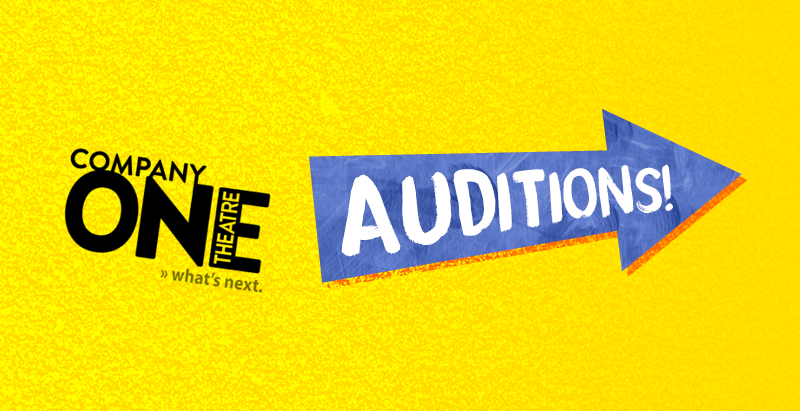 Company One Theatre is holding auditions for non-union actors on Thursday, April 11 starting at 6:30pm at the Artist Studios at the Boston Center for the Arts. If you’re interested in auditioning, please email auditions@companyone.org with a headshot/resume (if you have one), your availability on the audition day, and the character you wish to be considered for in Greater Good. Please indicate which character you are interested in auditioning for and we will provide you the correct sides to read at the audition. There will be a workshop pre-production April 29, May 1 and 3. Company One often offers internships in many different areas of design, production, and management, often tailored to the individual applicant’s schedule and interests. If you’d like to apply for an internship with Company One, please email your resume, and cover letter including your specific area of interest, to Sarah Cohan, HR Manager, at employment@companyone.org, and we will be in touch should there be an internship available in your area. AMPLIFY the process. AMPLIFY new voices. AMPLIFY connection. We are taking this opportunity to examine our new play processes to make sure they align with our core values as a company. While this work is underway, our submission window is temporarily closed. Please check back soon for more information on our new submission procedure. Company One is dedicated to artist development and supporting playwrights at all levels of their writing process. In an effort to create a more transparent and equitable process, next season’s open submissions structure will be geared toward relationship building, play development and dramaturgical engagement. Interested in participating in our PlayLab Unit or PlayLab Fellows programs? Applications will reopen in Fall 2018 for Season 20’s cohorts! Any questions about Company One’s new work activities should be directed to literary@companyone.org. If you have a strong interest in the mission of Company One Theatre, and would like to explore ways to become more deeply involved with our organization, please contact Board Vice President Elisa Choi at echoi@companyone.org.